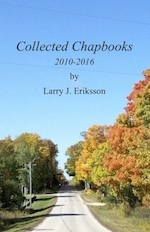 Collected Chapbooks contains eleven chapbooks by the author and published from 2010-2016: Moonlight (2010), Moments (2011), Mysteries (2011), Music (3rd ed., 2016), MindGames (2012), Marching (2nd ed., 2014), Memories (2013), MoodSwings (2014), Selected Poems (2014), Moving (2015), and Magic (2016). There is an index at the end of the book that provides easy access to any poem in the complete collection. First Edition; 5½ x 8½; 302 pages; 2016.